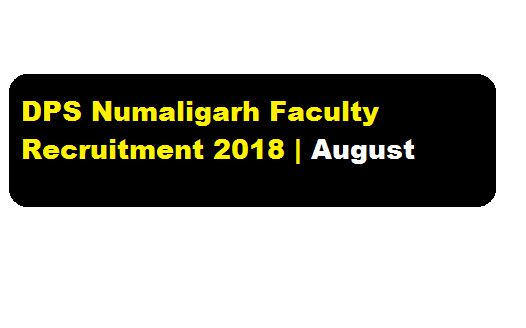 Delhi Public School Numaligarh Assam Recruitment 2018 August | Faculty Posts :- Delhi Public School Numaligarh, a leading public school of the North East Is looking for Faculty posts with good academic records, excellent communication skills and proficiency in co-curricular activities. Minimum qualification :– BA (Honours) in English with regular B.Ed and at least 3 years experience in teaching secondary classes. Emoluments as per VII Pay Commissions and DPS Society rules. Only shortlisted candidates will be called for written test. demo and personal interview. Management reserves the right not to fill-up the post if suitable candidates are not found.